This old favourite works well for kids of most ages, from about 5 upwards. It's also a great party game for sleepovers for pre-teens. Make enough slips of paper for 1 each. 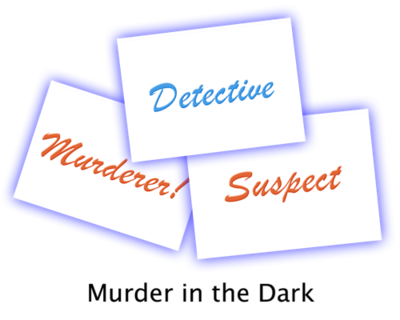 On one write "murderer", on another write "detective", and on all of the rest write "suspect". Put the slips in a bowl and let people take one each. You can not reveal to anyone what you are. Note: Be sure to play this in a room where no one will bump into any sharp things. Someone counts to three and turns off the lights. The game begins. The murderer finds people and taps them on the shoulder. If you are tapped on the shoulder and are a suspect, simply fall to the ground, making a few dying noises. If you are tapped and you are the detective, you say "detective is dead". When the detective is killed, the lights go on. All dead suspects must pretend to be dead, and even the murderer himself can play dead. The detective then surveys the "bodies" and decides who they think is the murderer. If they guess wrong, the murderer has won, but if they guess right, the detective has won. To make it easier for young detectives, people can call out "Murderer, murderer" when they are killed. It's much more fun playing it in a fairly large upstairs area with a number of people, this way you add into the mix pillow fights (and possibly thrown toilet rolls). It is much more fun to have the detective stay downstairs - out the way, while everyone wanders around in the dark. The murderer whispers "you're dead" to whomever and the person has to scream loud enough to be heard by the detective. Once the victim has screamed, no one other than the murderer and detective can move (preferably the murderer will have rushed far away before the detective turns the lights on). The detective surveys where everyone is hidden and can dismiss people to go to one designated room (not used for hiding). The suspect must not speak, the murderer is the only person who can lie, and no one can say a name (whether it is the name of the murderer or not). The detective asks questions until they can guess the murderer. If the murderer is guessed then they must answer truthfully to the detective. More fun with more people! My version of the game is called "Murderer in The Crowd". What happens is everyone who's playing closes their eyes and stands against a wall. Someone who isn't playing goes around and chooses 2 people by tapping them on the shoulder. Those 2 people are the murderers. After this, everyone walks around shaking each other's hand. The murderers will scratch the people's hands. After 3 more hand shakes, the victim falls to the ground "dying dramatically. If one murderer scratches another, nothing happens. If someone gets an accusation, they can raise there hand, but not if they've been scratched, if their dead, or if they are a murderer. The game is actually to help in drama class, but it's still fun no matter where you are. I've played a game like that, but instead of scratching, poked people's palms for the murderer. Well when I play this game with my friends, I play it differently. First of all, there is no detective or cop, anything like that. It's just the murderer, and that's it. So we meet in the middle after someone finds a body (by yelling "body" to say that someone is dead.) or by the 10 minute period passes. And then we discuss there who the murderer might be. It's intense after night one. I'm doing it for my Halloween party coming up soon. Great game in a big house when you all leave the room and wander round in the dark waiting for the murderer ! worse game ever i mean really this is like the "One and two many Deaths" So here is a real game. Everybody do the same think except make the d the cop. After the cop gets a water gun. Then everybody goes around the house and someone counts down to start. The murder tries to kill everybody even the cop. If murder kills everybody then he wins. After the cop shoots an person who got shot has to say if they were murder or not, If yes then innocents win but if not and its a innocent then cop dies. Any innocent can pick up the gun from dead cop and use to defend themselves. Same thing when the innocent shoots someone. So to name this game it is "TITANIC THE BEGINNING" I hope you give this thumbs up and i will come out with more murder games. I was confused too...plz help does the detective ACTUALLY come back to life?? coz u said that the detective then investigates? thanks for it! it was fun! it sounds like a good game! <3 love the idea. turning 12 soon. my friends will love this. :D:)8| hope it is nice out! My Birthday is in about a month (Jan. 18) and I was looking for fun party games and i found this, and it sounds so fun! I USED TO PLAY THIS AS A KID!!!! My goodness!! Thank you! I want to play this with my baby cousins when they visit!!! this is quite cool for a b-day party but for kids maybe 5-7yrs old! I was going to play this birthday party game with my friends! Me+my friends are gonna play this at my bday ive played it before, its so awesome i love it! Haha :D This Game Is Brilliant For Kids Of All Ages. i loved this game we playes it out side tho. This sounds so awesome! I'm having a spa party but still want games because i'm not sure if everyone's going to like the theme, but this game sounds soooooooooo fun! I CAN'T WAIT TO TRY IT OUT! what are the suspects supposed to do when the lights go off!? i love this game! played it at my bday party, its a lot of fun, especially if you do it in a small place, like a bathroom or if you have a walk in closet! Everyone knocks into each other and its pretty fun! I WILL PLAY IT AT MY SLEEPOVER ON FRIDAY MY FRIENDS WILL LOVE IT! i do not understand the game,can someone explain to me. What if the detective is killed first? They stop, and the detective must simply take a guess. A more innocent version could be Freeze Tag, and the play stops when the chosen 'detective' role is tagged. Of course, it can get difficult when the kids are frozen and you're trying to move around! I played this at a family gathering with the kids...The detective guessed right because the murderer got her last! wow im havein ga b-day party next weekend and we are SOOOO gonna play this .... thankz for puting it on here !!!!!!!!! is there a more innocent version- like different words and name, just same type of game? i have a question. who surveys the suspects if the dectective is killed???!??? This game is sooooo fun you should really give it a go!!! this game sounds good but doesn't really make SENSE!!!! I've been playin this for years! My friends and I called it something else though. It's loads of fun! And funny! I Am Going To Play This With My Friends At My Next Sleepover! Im Hoping I'm The Murderer So When The Detective Dies,I Can Pretend To Be Dead! I'm going to play this game on my sleep over tomorrow.Thanks for the idea. this game is the best halloween game ever!!! VERY KOOL!!! THIS WEEKEND HAVING FIRST SUMMER PARTY WITH BOYS!!!! IT WILL B A GREAT HIT! This is an awesom games i luv it!!!!!!! i cant wait to try this i suggested it to a friend and she's going to use it for her sleep over! this game sounds quite fun and I am gonna play it @ my sleepover! This is the most perfect game for my birthday party and sounds like tons of fun. Its really fun! I play this a lot whenever I am bored! I am so happy I found this website!!!!!!!!!! A great game (even for 3 people)! It was fun! Thanks1!! We are definitely going to play this at our next sleepover (tim's first ever sleep-over!) Make sure you don't lose the game. gthis game played so many time love it and all my friends do to. It's a great game. When we used to play it at parties in England, the detective would ask everyone what they were doing at the time of the murder. They would make up silly answers. That way the detective could have a better chance at guessing by seeing how guilty they looked or whether they giggled when answering. MURDER IN THE DARK IS FAB!! I PLAYED WITH MY GRANDMA!I DIDNT THINK SHE WOULD REALLY DIE THOUGH MAYBE I DIDNT QUITE UNDERSTAND THE RULES?! THIS GAME IS REALLY FUN AND I WOULD LOVE TO PLAY IT AGAIN.I PLAYED IT WITH MY FRIENDS AND FAMILY. Me and my whole family play it in my grandparents hotel at Christmas as it's closed to guests in autum...awesom fun! THIS IS THE BEST GAME!!!!! ohh, i can't wait to play that with my friends tommorow night! This game sounds like s00 much fun! I bet my friends will love this game! this is the best game ever!!!!!! Thats a great game to play with the kids I babysit!!! i love this game! !.i even play it just with my little brother and sistersi kind of stopped playing after the fan fell on my foot and cut it open....but i guess that makes murder even more bloody! this game sounds awesome! im going to a sleepover today and we are for sure going to play it! This game's awsome, I always play it!! i <3 this game. it makes me so happy. hours of fun, makes a great party theme. get your friends together, dress up, and have a murder mystery party! I alway's play it at my sleepovers, it's getting a bit old now. wow, that sounds like woah funn! i`m gonna try that! Sounds really cool I might play at my sleeepover. This game is awesome. It is a great time consumer!!!!!!!!!!!!!!! !